« A Round of Applause (and an Apple) for Teachers! You Know You’re a Museum Mom If…. Over the years I’ve had the chance to see children grow up right before my eyes as they’ve attended classes at the DMA. They may solemnly gaze at me from their strollers in Art Babies, toddle around with their binkies in Toddler Art, and then proudly graduate to the “big kid” art classes before confidently marching off to kindergarten. I’ve also had the opportunity to get to know many amazing moms in the community. They push strollers, wrangle kids, balance wet paintings on their arms, and cheerfully champion their children’s creativity. In honor of Mother’s Day, here are just a few of the things we love about Museum Moms! Fun is often messy. Museum moms aren’t afraid of messes—even big ones! We’ve challenged children to paint with their feet, create dripping, gluey sculptures, and blow colorful paint bubbles onto paper. 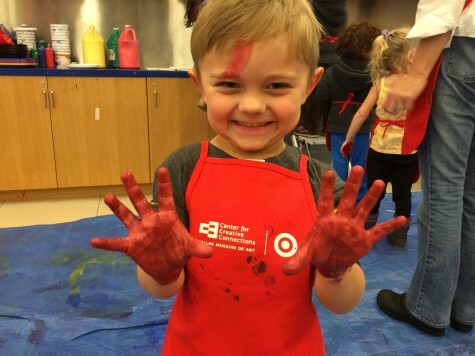 To say that we sometimes get messy in the Art Studio is a bit of an understatement. But our DMA moms are always enthusiastic, encouraging their children to try something new and to not let sticky fingers hold them back. As we’ve conducted fun painting experiments in the studio over the past few months, I’ve watched children gaze at their moms in wonder as they strip off their shoes and socks, push up their sleeves, and dive into some serious action painting. Sometimes you just need to shout! We hope that every child finds his or her own unique voice, and through our family classes, we do our best to give children opportunities to share those voices. Museum Moms value what their children think and wonder about art, and often let them lead the way in talking about what they see. 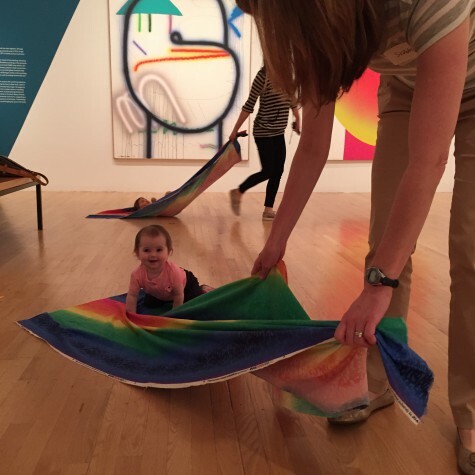 In a recent Art Babies class, caregivers pulled their little ones across the floor on colorful fabric to mimic the sensation of paint gliding across a canvas. Amidst the giggles and smiles, one baby accidentally discovered the wonderful echo she could make in the galleries. A comical shrieking match quickly broke out as other babies realized they could make their own echoes too, and the gallery was soon filled with high-pitched, delighted squeals. Rather than frantically shushing their children, these wise moms simply reveled in the display of spontaneous joy that came from children making discoveries in an inspiring place (and took advantage of the fact that there were no other visitors in the gallery). Being present is the best present. 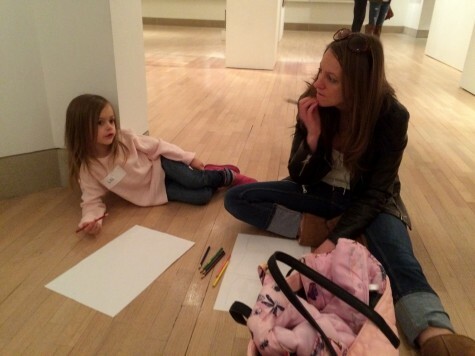 We’re all about family togetherness here at the DMA, so when we’re sketching in the galleries or posing like a statue, more often than not, the grown-ups are right alongside their child, busily engaged in a class activity. Museum Moms know that their children watch everything they do, and that the best way to raise a creative child is for children to see you nurturing your own creativity. In a preschool class several years ago, I asked a group of three and four year olds who some of their heroes were. Lili piped up immediately and said, “My mom is my art hero because she watches while I paint.” When we’re busy creating in the Art Studio, I always have at least one or two children who inform me that their masterpieces are “for my mom.” Museum Moms are some of the very best at creating lasting memories for their families and giving the gift of their presence. To all the moms out there, thank you for all you do! Happy Mother’s Day! Leah Hanson is the Manager of Early Learning Programs at the DMA.